The first book to provide a full history of the development of architectural conservation, A History of Architectural Conservation is considered a landmark publication by architectural conservation students and professionals the world over. 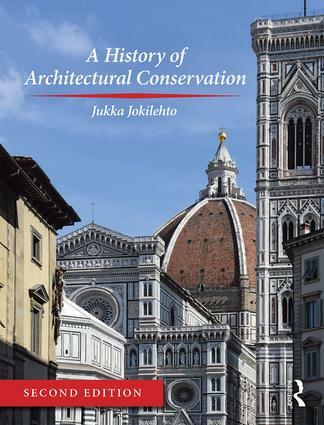 Twenty years after its first publication, this new edition of Jukka Jokilehto’s groundbreaking book continues the story to bring the history of architectural conservation right up to the modern day. Jokilehto draws on his distinguished career of over 40 years at ICCROM (International Centre for the Study of the Preservation and Restoration of Cultural Property, founded by UNESCO) to provide studies from Europe, the Middle East, the USA, Japan, India, China, Australia and South America. This accessible and well-written introduction to the history and theory of architectural conservation is richly illustrated in full colour and will be an essential go-to guide for students and practitioners worldwide.